A consistent challenge for NATO has been the issue of involving non-NATO partners in its interoperability and capability boosting activities. When NATO undertakes important operations at the behest of the UN Security Council, non-members have contributed forces – for example, Japanese and the Republic of Korea vessels have participated in Operation Ocean Shield, NATO’s response to piracy in the Gulf of Aden. The Partnership for Peace and similar initiatives also go some way toward enhancing political cooperation. But when it comes to training and the development of best practices, non-members have been reluctant to engage with the Alliance. The Finnish Navy is the exception to the rule. Despite its lack of NATO membership, Finland has for many years participated in the work of the NATO Centre of Excellence for Operations in Confined and Shallow Waters (COE CSW). Coordinated by Allied Command Transformation, the Centres of Excellence are multinational institutions that, according to NATO, “train and educate leaders and specialists from NATO member and partner countries…” and assist in expanding the Alliance’s capacity to operate in varying environments under diverse conditions. Many of these COEs take the form of research hubs, with experts spending time not just training personnel from NATO and its partner countries, but also working on policy and technological solutions to specific challenges currently facing the Alliance. There are currently 17 accredited COEs, though another three are awaiting accreditation. Based in Kiel, Germany, the COE CSW is concerned with a number of issues relevant to naval operations, such as anti-submarine warfare, mine countermeasures, as well as force and harbour protection. Aside from the Finnish Navy, participants include Germany, Greece, the Netherlands, Poland, Turkey, and the United States. It must be noted that not only is Finland the only non-member to participate in any NATO COE, but the COE CSW is also the only Centre in which Finland participates. Why is this? 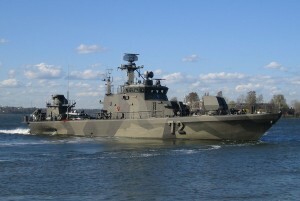 A possible explanation is that the Finnish Navy has a demonstrably strong interest in operations related to confined and shallow waters. Illustrative of this, in previous years Finland has led the organization of Northern Coasts, annual large-scale naval exercises that involve several countries and take place in various parts of the Baltic Sea. The explicit objective of these exercises is to improve interoperability in confined and shallow waters among participating units and countries. By way of contrast, Finland has not participated in any of NATO’s annual Steadfast Jazz exercises, which involve all branches of military forces and also take place in the Baltic region. Aside from wishing to preserve cordial relations with the Russian Federation, Finland’s policy of abstaining from Steadfast Jazz may have a lot to do with the exercises’ lack of simulated operations in confined and shallow waters. There are valuable lessons that can be drawn from the Finnish example. If NATO seeks to intensify engagement with partner countries, it will be necessary to identify the security interests of those states and then market NATO’s relevant capabilities to them. The activities of the COE CSW are appealing to Finland because of that country’s particular security interests. Had Finland instead been approached to engage with the NATO COE in Cold Weather Operations, it is less likely Finland would have agreed to participate, in part because the Finnish military would have contributed much expertise in exchange for comparatively less benefit. Understanding that the Finnish Navy participates in the COE CSW because it views it as a net benefit for Finland, NATO’s Allied Command Transformation (ACT) – charged with promoting interoperability – could advance NATO’s external relations by carefully marketing NATO COEs to relevant partners. For example, with the Ukrainian government actively seeking to achieve energy independence from the Russian Federation, it could be worthwhile to seek Ukrainian participation in the newly accredited NATO Energy Security COE in Vilnius, Lithuania. Practical cooperation through these centres could build momentum toward greater political cooperation. With the diverse array of expertise and specializations represented by the accredited NATO COEs, the possibilities to engage partners are endless. Paul Pryce is a Junior Research Fellow at the Atlantic Council of Canada. With degrees in political science from universities in both Canada and Estonia, he has previously worked in conflict resolution as a Research Fellow with the OSCE Parliamentary Assembly. His research interests include African security issues and NATO-Russia relations. This article was cross-posted by permission from and appeared in its original form at the Atlantic Council of Canada. Any views or opinions expressed in this article are solely those of the authors and the news agencies and do not necessarily represent those of the Atlantic Council of Canada.